On the evening of 13 July 2001, as Beijing held a press conference in Moscow to celebrate securing the 2008 Olympics, they had an unexpected visi­tor: François Carrard, the Swiss lawyer who was executive director of the International Olympic Committee (IOC). Normally on such occasions the IOC keeps its distance and lets the victorious city have its moment in the sun. But Carrard felt he had to address the media on the human rights issue. In the lead-up to the vote, Beijing’s rivals, in particular Toronto and Paris, had made much of China’s human rights record. As the members gathered, some 50 protesters assembled outside chanting “Free Tibet”. The Russian police, some wearing riot gear, broke up the protest and six people were seen being taken away in a waiting bus after demonstrators tried to unfurl three banners on the Moscow River embankment, opposite the World Trade Centre where the IOC was meeting. There were reports of 12 arrests. The IOC had so far refused to discuss human rights, arguing that it was only concerned with making a decision about sport. Nor was the issue addressed by the Evaluation Commission that visited the bid cities and whose assessment formed the basis of the IOC members’ decision. The report of the commission was crucial as, following the revelation of the 1998 Salt Lake City corruption scandal in which IOC members were accused of taking bribes, they were subsequently barred from visiting bid cities. Just before the vote for the 2008 Games, Hein Verbruggen, the Dutch chairman of the Evaluation Commission, summarised to his fellow members the various potential risk factors of the bidding cities. But he did not mention human rights. Beijing did face a question on human rights during its presentation. But this was delivered in such a roundabout way that only seasoned IOC observers could have understood it. Roland Baar, a rower from Germany, raised the ethical issue of playing beach volleyball in Tiananmen Square. Beijing had proposed this idea, but it had been shelved after objections from the Evaluation Commission that it was not a suitable venue. Baar was so circumspect that he did not even utter the words “Tiananmen Square”, lest it offend the Chinese. Long before the Beijing Olympics was staged it was clear that this was an impossible bet, and in the end Jacque Rogge, who was elected president of the IOC a few days after the vote in Moscow, made it clear that it was no busi­ness of the committee to monitor China’s moral development. Indeed, Rogge confessed that the IOC neither had the power nor the ability to do anything on human rights. The result: China rode out the protests that accompanied the Games, in particular the ones that marked the torch relay. China, as it had always planned, used the Games to show they could take the Olympics, a western invention, and do it better. By the end of it, IOC members were applauding the Games as China’s giant coming-out party and declaring the bar had been raised to such an extent that other countries would struggle to match it. All talk of human rights and opening up the country had vanished. The fact was that the Games went to Beijing not because the Olympic movement thought it could change China, but because of wider geopolitical considerations. The overwhelming view of IOC members was that the Games had to go to the most populous country in the world. China had been a good Olympic member. Whatever its human rights record, there was no Olympic reason to refuse the bid. There was also a fear that Beijing, having failed in 1993 when it lost to Sydney by two votes, might walk out of the Olympics if China did not succeed this time. The 1936 Olympics, which left us the legacy of the torch relay, offers a template for the use of sport for ulterior purposes with its extraordinary mixture of opportunism, improvisation and attention to detail in the Nazi preparations for the Games. But Hitler could not have fulfilled his agenda to show how normal his regime was if leaders of international sport had not played into his hands, with their willingness to believe dishonest public assurances and to accept gestures and symbols rather than look at reality. Since then, sports leaders have often looked the other way when major sporting events are held against a background of state violence, in countries whose repressive regimes seek to present themselves as open societies to the outside world. The list includes rebel South African cricket tours of the apartheid era, financed by tax concessions by the white regime, the 1968 Mexico Olympics, the Ali-Foreman fight in 1974 in a Zaire ruled by the brutal and corrupt despot Mobutu Sese Seko, and the 1978 World Cup in Argentina, organised by a junta which, even then, was embarking on a massive programme of killing people opposed to the regime. Back in 1851, when Prince Albert wished to advertise the might of Queen Victoria’s realm he held a Great Exhibition — essentially a trade fair displaying the works of industry of all nations. There was culture in the form of Charlotte Bronte, Lewis Carroll and George Eliot, but no sport. Today, sporting events have come to replace trade expos as a symbol of national success. Nelson Mandela used the power of sport, particularly rugby, to woo the whites, and felt that the rainbow nation had arrived when in 2010 it became the first African country to stage the football World Cup. 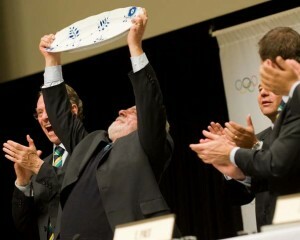 In Copenhagen in 2009, President Lula of Brazil shed tears after Rio won the right to stage the 2016 Olympics. “Everybody talks of Brazil as the country of tomorrow,” he said. “Here in Copenhagen tomorrow has arrived.” His pleasure was all the greater as Rio had beaten Barack Obama’s Chicago, despite the fact that the most powerful man in the world made a personal plea to the IOC. But the problem for sport is that, unlike expos, it carries a moral dimension. It is interesting to note that Beijing’s rivals made much of this distinction. Claude Bébéar, president of the Paris bid, made it clear he would have no problems with a Chinese city hosting an expo, but not the Olympics. Giving China the Games, he argued, would indicate moral approval for the regime. The idea that sport had universal significance emerged only in the 19th century as the rules for modern sports were being formulated. In his fictional novel Tom Brown’s Schooldays, Thomas Hughes presented his headmaster at Rugby, Thomas Arnold, as a sporting guru. His message, said Hughes, was that sport could reach out beyond the playing fields more effectively than any other form of human activity. Indeed, sport could shape society for the greater good. It is clear the telegraph, railways, the telephone, the passionate research in science, congresses and exhibitions have done more for peace than any treaty or diplomatic convention. Well, I hope that athletics will do even more … let us export runners and fencers; there is a freetrade of the future, and on the day when it is introduced within the walls of old Europe the cause of peace would have received a new and mighty stay. Modern sport is essentially the marriage of Hughes’s big idea in the private realm – that sport develops character — with Coubertin’s big idea in the public realm — that sport can transmit values within and between nations through regular international competition. The problem arises when sport collides with political reality, as it did in the wake of the Arab spring. As millions rose up in the Arab world last year to challenge and even change their despotic rulers, in Bahrain the desire for freedom came into conflict with modern sport. In the picturesque words of the Daily Mail’s Martin Samuel, the result of “little brown people” wanting freedom meant “the next thing you know is there is one less place for rich white guys to race cars”. Formula One’s first Grand Prix of the season was due to take place in Bahrain in March, just weeks after the kingdom had been engulfed by protesters demanding more freedom. There had been highly publicised protests at the main Pearl Roundabout in the financial district of Manama with some 31 protesters killed. Armoured cars, including Saudi troops and forces from Qatar and UAE, had rolled into the kingdom to restore order. How could a sports event take place in such a climate? And where was the moral compass of sport in even thinking it could? The race was the dream of Crown Prince Sheikh Salman bin Hamad bin Isa al Khalifa, who had made it clear that money was no object in bringing one of the most high profile world events to his desert kingdom. The Bahrain government funded the race. The Sakhir circuit, where the Grand Prix had been run since 2004, had cost some £92m. The F1 organisers had been paid £24.6m to allow Bahrain to organise the opening race of the 2010 season, and this had risen by 60 per cent for the 2011 race. The protesters knew how dear the race was to the Crown Prince and that if they wanted to wring political concessions from him, they had to hit at his beloved sport. However, the F1 organisers of the race did not seem to understand the moral questions involved. Neither FIA, the governing body, nor Bernie Ecclestone — the F1 rights holder — wanted to put their heads above the parapet. Their reluctance, it was assumed, was due to the fear that if they cancelled the race they would stand to lose £37m in rights fees. In the end, the Crown Prince himself decided the race had to be put back, hoping it could be held later in the year. His wish appeared to have been granted when, following an FIA inspection team visit, FIA’s World Council unanimously agreed that the Bahrain Grand Prix would now be held on 30 October. The decision provoked outrage from human rights activists and race fans. Many argued that for all the talk of high values, sport was more bothered about Mammon and ended up conspiring with despots. The FIA’s judgement was further called into question when details of the inspection report emerged. Over a two-day trip, the FIA had met the minister of culture and tourism, the minister of the interior, had had lunch with the board that runs the Grand Prix, met circuit personnel and visited a shopping centre. But they had not met any of the dissidents. It was clear that the race could now not go ahead at the rescheduled date either. However, it was logistics not morality that was given as the reason for the cancellation. The new date for the race in October meant Bahrain would get India’s Grand Prix schedule – the new Formula One commercial centre – and extend the calendar into December. The teams just could not cope with the pressures this would create. The Formula One world did not seem to appreciate that the government in Bahrain was about to use the Grand Prix in support of suppressing human rights. For all the moral high ground Formula One may like to claim, when faced with a stark ethical issue it is powerless and has to duck and dive. The same drama has played itself out again this year, with F1 facing international condemnation for holding the race in Bahrain. Sports administrators may present themselves as the Vatican of sport, beyond the control of any authority but their own. Yet the money needed to run modern sport means they have to compromise with dubious governments and regimes. The result is that the high moral purpose of sport is sacrificed if not totally ignored. 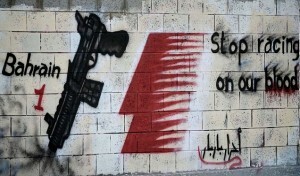 And until sport can deal with this basic contradiction, problems such as Bahrain will continue to appear. The worrying thing is that few in sport seem willing or able to deal with it. Speaking as a fan of various sports, including Formula 1 which Mihir mentions, I find the F1’s disregard for human rights issues to be reckless and naive. It does not make most involved in the sport immoral though, simply so dedicated that they’re unable to take in anything outside their area of expertise. I am also finding the attitude of human rights organisations frustrating though. By attacking sport they are alienating potential supporters. I grew up believing that sport could not be affected by politics and it is an ideal that I and a lot of other sports fans still hold to. Sport may seem trivial to non-sports fans but it is not something we can just drop from our lives. It is inspiring, it allows me as someone with Aspergers to form connections to people and things. It is something that human rights activists now seem to expect people like me to do without. 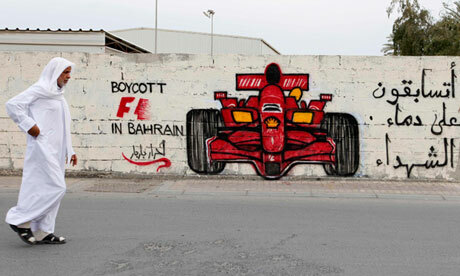 Now I thought that the 2012 Bahrain Grand Prix was a bad idea and campaigned against it but for some that is not good enough. They seem to think that being a sports fan is what’s stopping people like me from getting more involved in their cause. In fact they are alienating people with their attitude, a recent article on an F1 website described the alliance between the Montreal protesters and Anonymous as “cry babies, bullies and terrorists”! True most sports people are ignorant about human rights but human rights people are equally ignorant about sport. They don’t recognise that people and society needs sport as an escape from the uglier parts of life.